Looking for a pumpkin pie alternative for Thanksgiving? 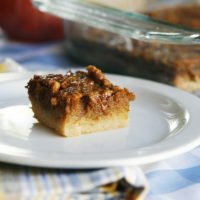 These Pumpkin Pecan Bars are bite sized treats that combine the deliciousness of pumpkin pie and pecan pie into one unforgettable bar. This year, for the first time in years, our Thanksgiving celebration will include a big dessert spread. That’s not to say that we don’t usually have dessert — we do. However, over the last several years dessert has been a communal affair that brought several family celebrations until one roof. But since our cousins aren’t hosting Thanksgiving for their part of the family this year, dessert will follow dinner at my house. I am a little excited about that. Mostly because it means I have an excuse to add a little baking to my holiday repertoire. In fact, I am debating about having a dessert cook-off of sorts, where everyone contributes a dessert and we vote on the best. Nothing wrong with a little friendly competition among family, right? 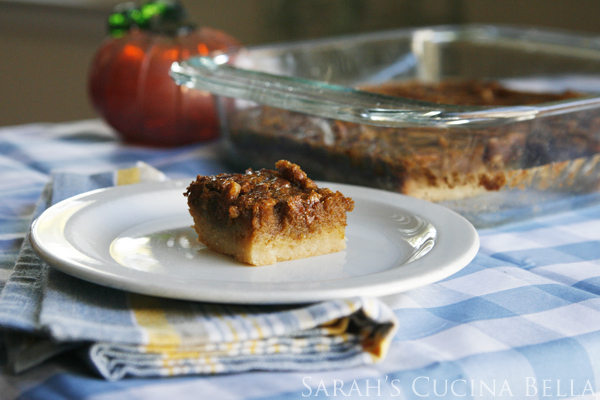 These Pumpkin Pecan Bars? They are practically a sure thing for Thanksgiving dessert this year since they bring flavors of traditional desserts into one flavorful bar. These begin with a buttery three-ingredient base. You mix up the base in a food processor and then press it into a pan to prebake — which sets the base. 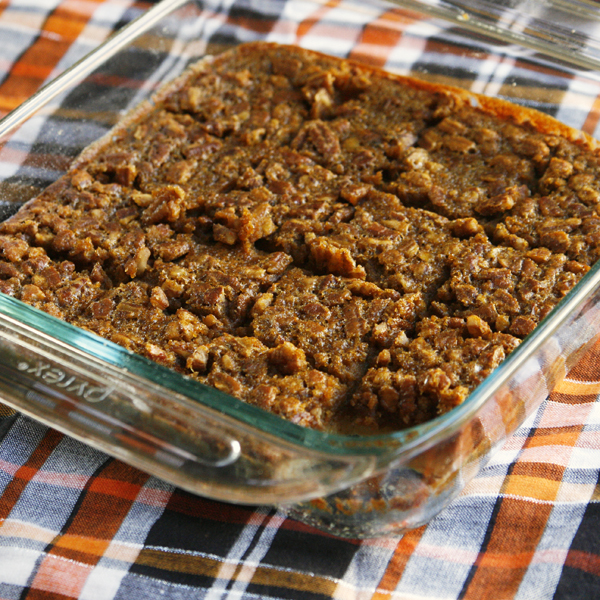 Next up comes that thick, delicious layer of pumpkin and pecan. It’s sweet and rich and oh so ready to bake into an amazing topping. These bars are somewhere between pie and cookie, and combine the flavors of pumpkin pie and pecan pie into one rich, buttery bar. It’s like the best of all worlds … and they are so easy to make that whipping these up is a total stress-free experience. Combine the ingredients for the base in the bowl of a food processor and process until coarse crumbs form. Pour into an ungreased glass 9x9-inch pan and press into a single layer. Bake for 20 minutes. The edges should be slightly golden when you remove it from the oven. In the bowl of a stand mixer, combine the pumpkin puree, eggs, light brown sugar and pumpkin pie spice. Beat on medium until smooth. Add the pecans and beat briefly to combine. Pour the topping over the pre-baked base of the bars. Bake for 30-35 minutes, until the topping is set in the center. Remove from the oven and let cool completely before cutting into 12 bars. I actually love desserts like this even more than traditional pies… You can cut them up and serve on a pretty platter. These look ah-mazing! Me too! You have the wheels in my head turning. I love this idea. I would probably take it one unhealthy step farther and use pralines instead of pecans. Oh, that would be incredible! Any suggestions on how to make this gf? It sounds so yummy…I would like to bake two versions. Thanks for the suggestion, Terri! Barbara, the one thing I would note is that I haven’t tested any GF variations, so I am not sure how substituting oats or any other GF options would impact the outcome. I am making this for Thanksgiving tomorrow and super excited!! I am taking it a step further with a homemade salted spiced rum caramel sauce I made tonight to place around each slice when plated tomorrow! Thanks can’t wait to taste one !! Wow — how was it? These were amazing, easy and delicious. I recommend them to everyone now. Thank you, Nicole! So glad you loved them! !